but that would also bring in a small income. 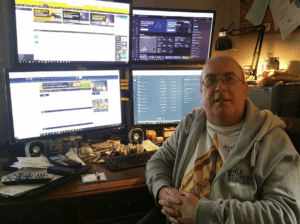 I was already experienced at scalping on Betfair but then after many searches on google and YouTube I came across Matched Betting, and then once the new customer promotions had been completed I progressed onto arbing. reviews were positive and the price was competitive compared to the competition. After leaving my job I now need to make just over four figures a month to cover my expenses, and so saving the need to find gainful employment (hit this target in April and May) I currently use a four-pronged attack to relieve the bookmakers of this money. Matched betting from new account promotions, matched betting from free bet offers, pre-event scalping on Betfair and arbitrage betting. Betslayer is easy to use and the one button function to take you directly to the bookmaker page for the arb is great. The adding of exchange sites Betfair and Smarkets is a huge leap in the right direction for the highlighting of more arbs. Opportunities found on Smarkets though are often not viable though through to the lack of liquidity in the selected market. Don’t jump on every arb that is highlighted. You might be able to make a fiver on a Norwegian Third Division match but that won’t keep your accounts open for long. I have now become more selective and just concentrate on top division European soccer, MLB, Japanese Baseball and NBA games. The opportunities are fewer but you can usually get more money on the selections you do arb. When you begin a session make sure you check your Betslayer filter settings to make sure you are seeing all possible arbs. After initial deposits into bookie accounts try to make sure you make a deposit via Skrill so that when you need to withdraw you can withdraw to Skrill, funds become available much quicker than withdrawing to a bank account. You will get accounts closed or restricted, it will happen at some point, don’t fret about it!